Instrument-Builder Pinazola // Workshop for Music and Acoustics. The spaces of Len Pappe's sound-installation relate the story of a workshop for the construction and invention of instruments. This acoustic scenography uses as building stones valuable oddments and remainders gathered from Hamburg Schauspielhaus Theater productions: extra props and pieces from its stage-design workshop. This use of remains is then pursued with the recycling of strings from the Knauer piano-repair service. The story concludes with the adventurous design of the viewer-immersive piano. The entrance foyer, which serves to stock parts and plan instruments, gives on to a long corridor, the so-called soundwave-lock. Its purpose is to activate and sensitize the ears before one makes the decisive step of entering the sound laboratory. Here, new playing techniques and acoustic phenomena can be investigated and tried out. This laboratory is a walk-in instrument. The Pinazola laboratory is now available to sound-researchers whose own experiments mesh into this installation – as it has also been lending itself as a setting for concerts by guest-musicians. “unlimited liability” welcomes Instrument-Atelier Pinazola // Workshop for Music and Acoustics in its space. 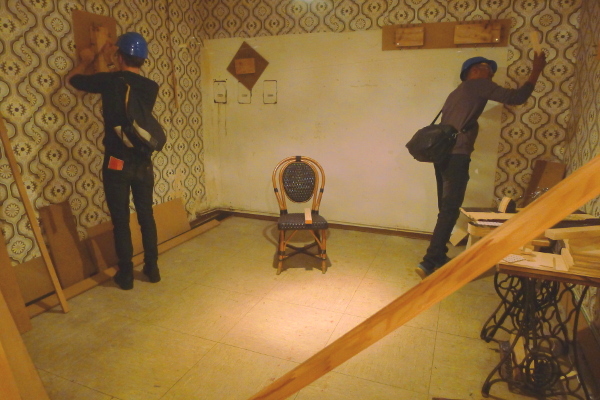 Len Pappe's installation and use of four rooms is in continuous transformance. It includes enharmonic inversions and the construction of instruments. Note: heightened security measures in place. In addition, guests were be able to strum and otherwise activate the fifteen wires already strung between the walls of the room. Outside the window bees buzzed is an experiment that makes use of the sound-laboratory in keeping with the Pinazola concept: a test set-up wich interacts with the spatial context and its sound characterisitcs. The sound-laboratory is thereby expanded in its potential for play and sound. Artists' statement: Lea Fabrikant riss sich mit den von Michel Chevalier geliehenen Klaviersaiten den Fuß auf, und zwar gerade in dem Moment als sie sich aus der kalten Dusche kommend in Sicherheit wähnte. Die beinahe unerträgliche Hitze im Dachgeschoss der Berliner Altbauwohnung, deren Art noch um 1920 herum von Walter Benjamin als “Mietskaserne” diskreditiert wurde und die sich mittlerweile zum Traum interessierter meist eher junger internationaler Menschen mauserte, vibrierte. Ansgar Wilken hatte sich nach Erlaubnis von Lea Fabrikant fast vollkommen entblösst, nur die Hose war noch an. Kleinstpercussionteile lagen auf dem Boden verstreut, es war immer noch nur die Probe gewesen und doch blutete und rumorte es und das Rehearsal hatte Züge angenommen, die den + 30 Grad dort draussen in der Intensität kaum etwas nachstanden. Plötzlich gab es einen Schuss. Lea Fabrikant und Ansgar Wilken hielten inne. Ansgar Wilken nahm einen Schluck aus seinem “Gösser”, Lea Fabrikant suchte etwas unter dem Tisch, ein Mobiltelefon surrte, Übersprunghandlungen gewannen für einen kurzen Moment die Oberhand. Jedoch war niemand verletzt, der blutende Fuß wurde mit Gaffatape versorgt, alles war in bester Ordnung. On October 1st David Wallraf's performance utilized modular synthesizers, guitar amps, and electro-mechanical devices directly activating / striking the piano-wires stretched between the walls of the space.